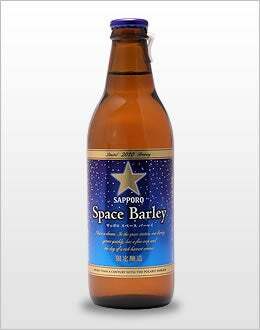 At last, the long awaited Space Barley—the beer made with barley grown in space—is here to take you where everyone has been before: Drunk. Fortunately, nobody can hear you shouting in space, which is good for my hangovers. What's so special about the Space Barley? The "space barley" used to make this beer is the fourth generation descendant of the Haruna Nijo malting barley that was developed by Sapporo Breweries and kept in space for five months during 2006 as part of our collaborative research with the Russian Academy of Sciences and Okayama University with the purpose of achieving self-sufficiency in food in the space environment. Since Sapporo Breweries was founded, we have continued to create excellent varieties for raw materials, and we are the only company in the world that operates breeding/research organizations for both barley and hops. This, the world's first sale of this "space beer," is the result of our extended nurturing/development of the required technologies.